Specific daily care for blemish-prone, oily, or combination sensitive skins. 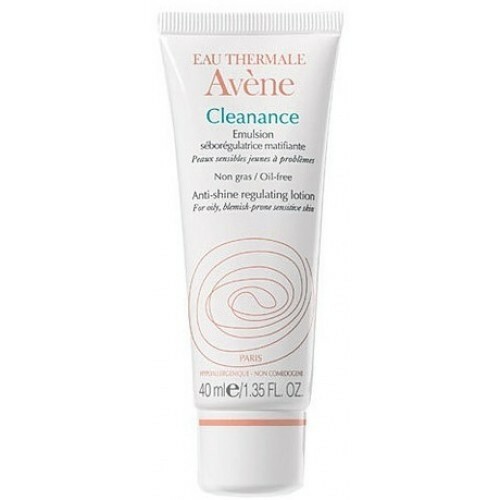 This ultra-light lotion addresses the hydrating needs of this skin type without irritation and contains a high percentage of soothing & anti-irritating Avene thermal spring water (69%). Helps regulate the secretion of sebum while purifying the skin & controlling oiliness. Thanks to sebum regulating capsules, this emulsion is an excellent make-up base, which holds longer. Apply AM/PM after thoroughly cleansing with Avene Cleanance Soap-Free Gel Cleanser. We strongly suggest that you visit a medical skin care professional for a complete skin diagnosis before purchasing Avene products. 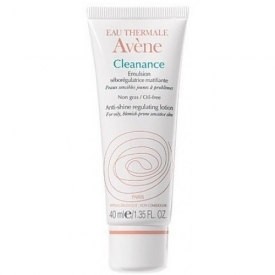 Avene Thermal Spring Water (Avene Aqua), Cyclomethicone, Propylene Glycol, Glycerin, Polyacrylamide, Plymethyl Methacrylate, Water (Aqua), C13-14 Isoparaffin, Zinc Gluconate, Butyparaben, Cetrimonium Bromide, Cucurbita Pepo (Pumpkin), Seed Oil (Cucurbita Pepo), Dimethiconol, Disodium Edta, Frangrance (Parfum), Laureth-7, Pyridoxine HCL, Salicylic Acid, Triethanolamine.